Jacaranda season may be brief, but for a short burst of time all of Los Angeles seems to be in purple-blue bloom. Ordinary trees explode in a riotous violet haze. Palm Drive becomes a tunnel; North Whittier a lavender canopy. Stansbury Street is engulfed. 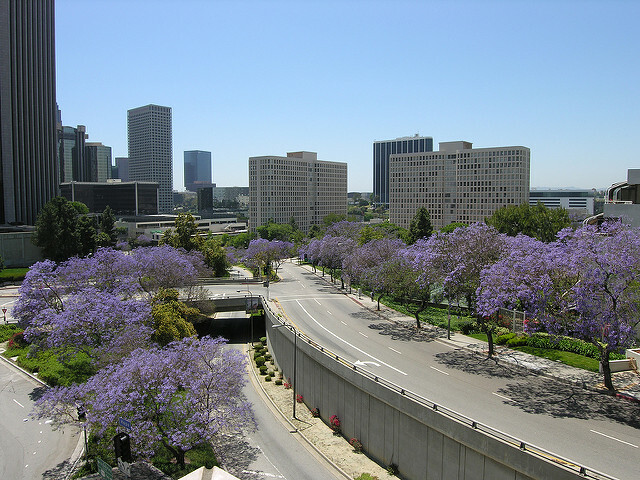 The Santa Monica stretch of jacaranda trees from Wilshire to Colorado on 3rd is a designated city landmark, and for good reason. Technically, there are 49 species of jacaranda trees, but it’s the Jacaranda mimosifolia, also known as the “blue jacaranda,” that is ubiquitous here. They bloom twice a year, once in spring, usually in late May or early June, and again in the fall. "Vladimir Nabokov is said to have claimed that he could live in Los Angeles simply for the Jacaranda trees." 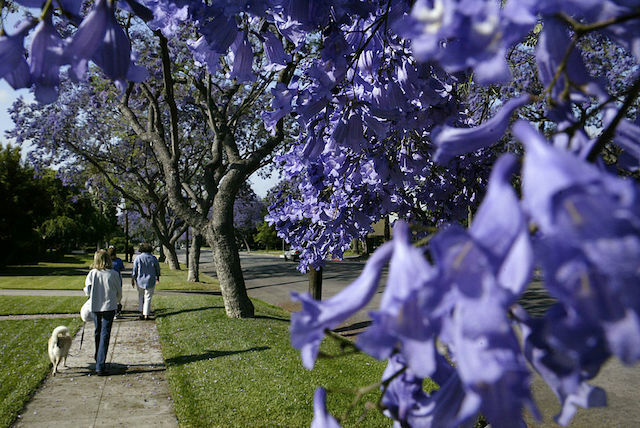 Like many things intrinsic to the city, jacarandas are not actually native to Los Angeles. The trees are indigenous to South America, originally found in the tropical and subtropical regions of Argentina and Brazil. Have you ever heard a more L.A. thing? One can only imagine what those weary midwesterners must have thought of us, we Californians, who grew things just for their beauty. 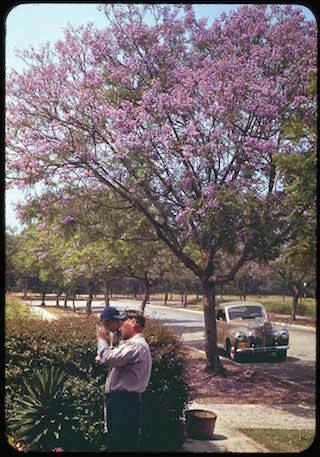 Vladimir Nabokov is said to have claimed that he could have lived in Los Angeles for the jacaranda trees alone. There were 148,530 jacaranda trees in the city, as of 2010. Mature jacaranda trees can reach 25 to 45 feet, with an oval canopy that spreads almost as wide as the tree&apos;s height. Up close, the trumpet-shaped flowers are an inch or two long, and usually five-petaled. From afar, they are a fairytale, a free pass to a foreign land. Skrzat directs City Plants, a public-private partnership that works with the city to expand L.A.’s green canopy and plant street trees. 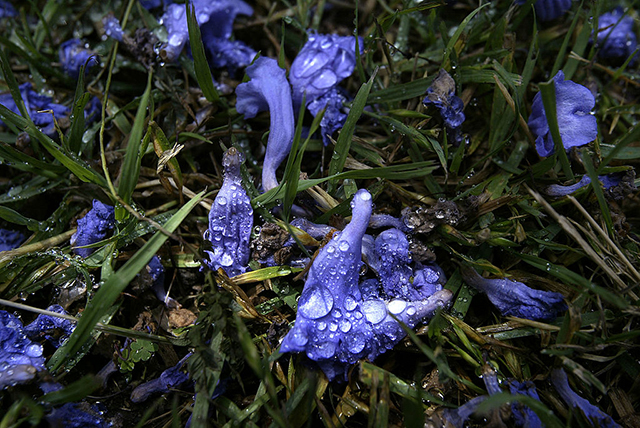 “We get a lot of requests for [jacarandas to be planted],” she said. According to Frank McDonough, a botanist at the Los Angeles County Arboretum, the jacaranda bloom has been especially profuse this year. “We had an evenly cool winter,” he explained, “followed in March by warm temperatures and somewhat significant rain and then—boom—warm weather right after that, which does interesting things,” McDonough said. “I’ve seen them since I was a kid,” he told me with a whiff of nostalgia. The botanist was born and raised here. The fall bloom is shorter and less certain, dependent on temperatures. According to McDonough, in years with strong Santa Ana winds, which coincide with bright sunlight and “heat everything up,” the jacarandas are less likely to bloom. Surely there is some poetic symmetry to that, the trading of one element of mythic Los Angeles for another. The exact timing of either bloom is as difficult to predict as the blossoming of any single tree. Even at the height of the spring surfeit, no two streets will flower on exactly the same schedule. "They’re like humans, and each tree has its own temperament,” a representative from the Bureau of Street Services explained over the phone one day last month. “A Southern Californian would still know that it was wonderful to be alive merely for the jacaranda,” a Los Angeles newspaper columnist wrote more than a hundred years ago. It remains true today. He posits that it’s possible they first arrived in California during the Gold Rush. Most of the schooner ships making their way west stopped in Buenos Aires, where they would have witnessed the glory of a jacaranda tree in bloom. McDonough explains that those early arrivals may have “brought seeds or clippings” with them to California. It’s also possible that freight tycoon Phineas Banning had the trees shipped in to his Wilmington estate from the Amazon in the late 1860s. All that would change in the new century. 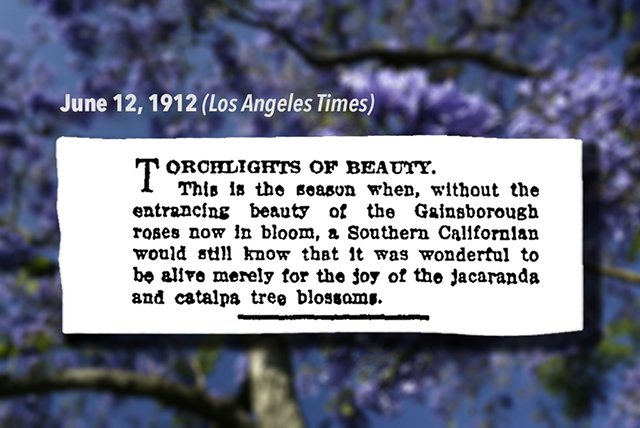 “The flowering jacaranda, which in June showers its purple blossoms on the passerby, has come as an ambassador from the Amazon to proclaim the magnificence of that court,” Lannie Haynes Martin wrote of Southern California in 1912. 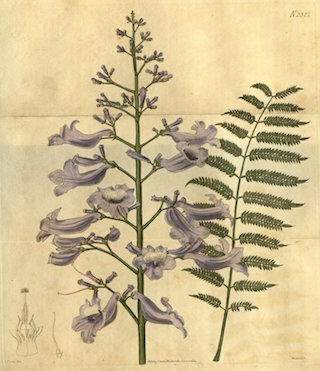 And for their profusion, we have but one person to thank, a pioneering woman who was arguably the Johnny Appleseed of not just jacarandas, but a host of other iconic Southern California flora. 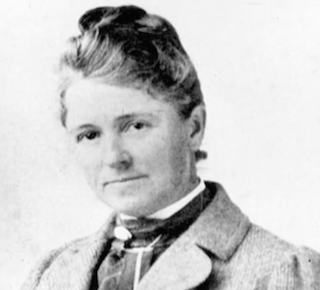 Her name was Kate Sessions and she spent more than 50 years importing seeds and plants into Southern California. She is credited with introducing and popularizing more than 143 species in Southern California, including our beloved bougainvillea, birds of paradise, yellow oleander, star jasmine, and, of course, jacaranda trees. It was a good place for a girl to fall in love with the natural world. 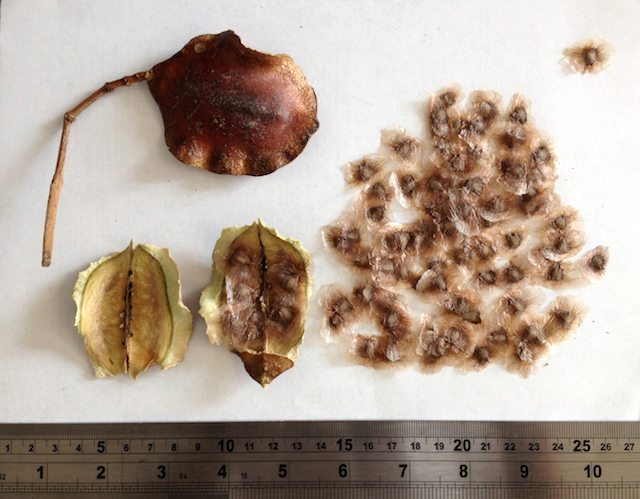 As a teenager, Sessions made a hobby of collecting flowers, drying and pressing them. For her 15th birthday, her mother gave her a black leather-bound notebook for preserving her specimens. The young Sessions spelled out the word “Herbarium” carefully in leaf fragments across its cover. Today, the book resides in the San Diego Natural History Museum. After Berkeley, Sessions worked as a teacher, then the only acceptable line of work for an educated young woman. She moved south to San Diego, and after a short tenure in the classroom, she left to do what she loved most—study and grow plants. “Her mind,” as San Diego historian Clair Crane once said, “was blank to everything except horticulture.” Sessions discovered that here in California, under the great western sun, things could grow that would never survive back east. She sought out plants that needed little water, and began to introduce many of the tropical species that had first caught her eye when she travelled to Hawaii at 18, along with exotic plants and trees from Latin America and others parts of the world that would be suitable for the Southern California climate and landscape. 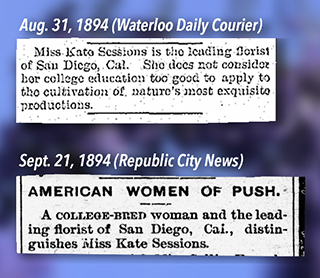 Sessions opened her San Diego nursery in 1885. Then 28, she would soon become the leading plant dealer in the area, her rise coinciding with a time of explosive growth in the region. Through her nurseries (she would own a succession of them, in Coronado, City Park, Mission Hills and Pacific Beach), Sessions wielded enormous influence over the physical character of the rapidly developing residential areas of San Diego and its environs. As environmental historian Vera Norwood explained, families moving into the area “looked not to landscape architects as much as to the local nursery owner to help them design and plant their grounds,” and, as Norwood wrote, “hardly any homeowner landscaped her yard without the advice and plants of Kate Sessions.” But Session’s legacy, according to the San Diego History Center, is most visible through her role as “Mother of Balboa Park.” New York has Central Park, London has Hyde Park, and, thanks to Kate Sessions, San Diego has Balboa Park as its crown jewel. Influenced by the growing parks movement across the country, San Diego had had the foresight to set aside 1,200 acres in its center for what was then called City Park, but the city lacked the resources or wherewithal to develop it. By 1889, “the large vacant tract had become something of an attractive nuisance,” with scattered trash, stray animals, and a “pest house” within its bounds. Desperate for space to expand her growing nursery business, Sessions struck up an enterprising deal in 1892: she would take over 32 acres of land in the northwest corner of the barren mesa, and in exchange for rent, she’d plant a hundred trees a year in the park, and make an additional 300 trees available to be planted around the city. The arrangement continued for a decade, with Sessions furnishing the city with an approximate total of 4,000 trees, including many of her exotic favorites, and, to some degree, inventing Southern California as the tropical Eden we know today. As her acclaim grew, her influence rippled outward from San Diego. At one point, a list was made of all the plants Sessions either introduced or popularized and made widely used in Southern California. It ran four pages long. Sessions died in 1940 at 82. She reportedly requested a death bed visit from then-San Diego City Planner Glen Rick in 1940. He was in the midst of developing the 5 freeway, and she wanted to tell him what sort of things ought to be planted alongside it. Jacarandas, like many of the plants Sessions introduced, were soon planted across the Southland, painting streets and skies purple from San Diego to Santa Barbara. According to McDonough, the trees became truly popular in Los Angeles during the 1920s and ‘30s, and their population further swelled during the middle of the century. The 1950s and ‘60s saw a concerted effort directed toward planting more street trees, alongside “the population and commensurate building boom that was occurring,” according to the Bureau of Street Services, who report that from 1946 to 1970 the street tree population in the city more than doubled from “perhaps 300,000 trees” to approximately 680,000. According to Elizabeth Skrzat of City Plants, street trees serve a number of useful purposes, including energy efficiency (shading homes and buildings, which then require less energy to cool), stormwater capture, and a role in combating the urban heat island effect. As “moderate” water users, jacarandas do well in our climate, and they are also tall enough to provide some energy relief. Interestingly, as Huell Howser pointed out in an episode of California’s Gold, despite their prevalence in Southern California (along with Australia, South Africa, and of course, South America), jacaranda trees are rare to be found across the rest of the U.S. Though the tree’s appreciators far outweigh the detractors in number, both camps seem to harbor their opinions with an intensity. Jacaranda foes complain of the trees’ endless violet litter, left behind as their petals soil streets and sidewalks, gumming up car windshields and sneaker soles. “People love them or hate them,” I heard over and over again in conversations with friends, botanists and bureaucrats. Gene Sherman, in a 1960 entry of his fantastic L.A. Times column Cityside, addressed this very quandary. “We’ve been getting a lot of complaints,” he quotes Bob Talmadge, a tree inspector with the city Park Department as saying. “People complain about the flowers. They fall down and then the kids track them into the house. And wall-to-wall carpeting being as important as it is today, you know...” Talmadge told Sherman. You know? In the half century since Sherman’s column ran, we’ve put a man on the moon, eradicated smallpox, invented the internet and seen the Soviet Union fall. Wall-to-wall carpeting may no longer be in vogue, but some things, it seems, never change. “A lot of people enjoy their beauty and shade, but we do get complaints in certain times of the year,” a tree surgeon with the city’s Department of Urban Forestry told me in 2016. “When it’s flowering, people complain about the fact that they walk through them and then they walk inside the house and stain the carpets,” he said. What exactly makes their blossoms so bewitching? Part of the magic must be their hue. Blue as a color is rarely found in nature—less than 10 percent of the world’s 280,000 species of flowering plants have the ability to produce blue flowers. But all the city is in Technicolor, and we have never been short on rare and lovely things. Surely, there must be something more to their spell. Here, you can sit at the edge of a swimming pool in the dead of winter and find it nearly impossible to ascertain the time of year or the age of the women sitting next to you. It could be January or June, and they could be ingenues, or old enough to be your mother. There are no seasons here, they say, no way to separate the days. How does one calibrate time when history is liquid and seemingly lived in the ageless present? Somewhere, likely in the basement of some talent agency, there must be a pile of Faustian pacts stacked a mile high. In a city of eternal sunshine, what could be more seductive than impermanence? Our eyes can adjust to all the evergreen beauty Los Angeles has to offer; stay here long enough and you’ll take it all in without even blinking. But the jacaranda trees? Blink and you’ll miss them. In fact—look up!—they’re already almost gone. "It’s the kind of tree you feel nostalgic for even when you’re standing right in front of it,” a San Diego horticulturist wrote. Their purple pageantry is the closest thing we have to seasons, to any season at all. They dazzle us and then disappear. And, as we look up at the space that was briefly purple and is now just sky, we Angelenos feel the rarest thing of all: time passing.